The 19-year history of the Florida Marlins has come down to its final day. Tonight, the team will switch its name to the Miami Marlins, and switch its venue into a brand-new stadium in downtown Miami. On the final day of the 2011 regular season, the Marlins unveiled the fan-decided top 10 list of all-time Marlins moments. 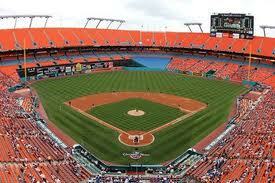 I’ve selected my own 10 moments of Marlins history, but a set of two for each name their stadium was known as. The Fish played in the same physical stadium for those 19 years, but the facility had 5 different names. Since I selected two moments from each name era, this is not going to be the top 10 list of all time Marlins moments because most of the great ones happened during the “Pro Player” era. Nevertheless, here we go! 1) April 5, 1993: 1st game in Marlins history- There’s no better place to start than the first game in the history of the Florida Marlins. 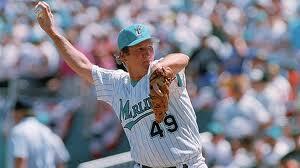 Sporting original teal hats, the Fish defeated the Dodgers 6-3 behind the first ever Marlins pitcher, Charlie Hough. The legendary knuckleballer is a personal idol of mine. He was an honorary member at the last game at Sun Life Stadium, and will most likely be in attendance for Opening Day in April. 2) July 11, 1995: 1995 MLB All-Star Game- Although this game was not played at Joe Robbie Stadium, it is still a great moment in Marlins history. 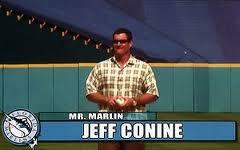 Mr. Marlin himself, Jeff Conine, homered in the 8th inning to put the National League ahead 3-2, which was the final score of that game. Conine was awarded All-Star Game MVP honors. 1) October 26, 1997: The number 1 Marlins moment as voted on by the fans, 1997 World Series Game 7- After setting a record by reaching the Fall Classic in just their fifth season, the young and talented Marlins capped their year on this fall night by beating the Indians with a walk-off single courtesy of Edgar Renteria. 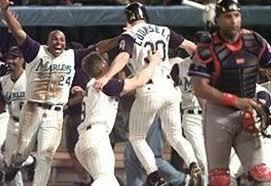 Craig Counsell scored the winning run, and the Marlins celebrated their first ever World Series Championship in their first ever postseason appearace. 2) October 25, 2003: The Marlins conquer the House that Ruth Built- Again, away from home, the Marlins wore teal proudly as Jack McKeon boldly made the decision to start Josh Beckett on three days rest. In a pitching duel, Beckett edged out Andy Pettite, who allowed the Marlins to scratch across two runs. Beckett dealt a complete game shutout to give the Fish their second Series title. 1) September 12, 2008: Cantu makes history with 25th home run- This day was picked not so much for the day itself, but the feat worked on the entire season that was finally accomplished on this day. Jorge Cantu’s 25th home run of the season made the 2008 Marlins infield the first ever Major League infield to have all four players hit 25 or more home runs in a single season. Hanley Ramirez, Dan Uggla, and Mike Jacobs all finished the year with over 30 each, and Cantu closed out the season with 29. 2) September 6, 2006: Anibal Sanchez no-hits the D’Backs- In just his 14th Major League appearance, Anibal Sanchez went the distance to throw the first no-hitter in the majors since Randy Johnson’s 2004 perfect game. Sanchez threw just 103 pitches, but was given scare on the last out when Hanley Ramirez took his sweet time to throw out Eric Byrnes by a mere half step. 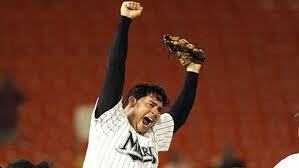 This was the fourth no-hitter in Marlins history. 1) July 17, 2010: Donnie Murphy walks off on Rockies- As I mentioned in the post: Walk-off wins, this may have been the best game I’ve seen in its entirety. The Cy-Young candidate starters, Josh Johnson and Ubaldo Jimenez, didn’t duel the way everybody expected. Jimenez exited the game after giving up a Mike Stanton bomb, but Jonathan Herrera made the Fish pay by hitting a three-run blast in the eighth to put the Rockies on top. But the “Unlikely Source,” Donnie Murphy, blasted a walk-off, two-run homer in the ninth to give the Marlins the victory. 2) June 18, 2010: Stanton’s Grand Inaugural- Ten days after his call to the majors, Mike Stanton blasted his much anticipated first big league home run, a grand slam as a matter of fact, to push the Marlins to a 7-4 victory at home against the Rays. 1) September 27, 2011: Byran Petersen’s walk-off home run- In the last ever series at Sun Life (or whatever name it may be) Stadium, the Florida Marlins got their last win on this walk-off home run. It came in the bottom of the ninth with no outs to give the Fish a 3-2 victory. 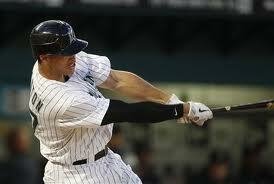 This was also the last home run at the stadium. 2) July 26, 2011: Mike Stanton’s first career walk-off home run- This was the first of three walk off shots for the Marlins in 2011, and it came against Philadelphia. Despite the fact that the Marlins were largely out of contention after a dismal summer, it was nice to see Philadelphia go down at the hands of Mike Stanton, who will probably have many more Philly put-downs in his career. But tonight the Marlins will undergo a name change, and a color change, to kick off a changed era for south Florida baseball. The ceremonies can be viewed tonight, starting at 9 p.m., on Marlins.com. It’s really amazing how much this franchise has done in so little years. I’ve always thought it was sad how people always overlook that. The Yankees didn’t even win their first pennant until 1923; that’s 20 years and 1 World Championship for the best franchise in sports! When you think of it like that, it’s just truly remarkable. It sure is. But when you look at the team, especially in 2003, it’s sad to see that all the players left the team the year after because of money issues. But now with the new park, and better revenue, I think we’ll all be good.